The Pars Xcite 8050QR (£699 inc. VAT) is an affordable machine in this class, making it an excellent choice for those on a strict budget. 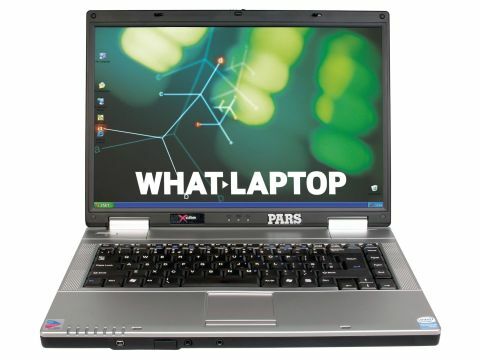 Instead you'll find an Intel Pentium M 750, which runs at 1.86GHz, and comes supported by 512MB of DDR2 memory. It is worth bearing in mind that while the speed rating of this chip is in line with Duo chips, you only get the single core and a slower Front Side Bus of 533MHz, as opposed to the 667MHz of Core Duo, so the system runs slower. With that in mind, the high MobileMark 2005 score of 221 takes into account single core operations, which for basic tasks is more than adequate. The chassis is plain and understated and is made from silver and black plastic. The build quality proved robust with plenty of protection behind the screen and a solid feel to the body. With an overall weight of 2.7kg, there is a reasonable degree of portability to be had, and with a battery life, under test, of 200 minutes, you'll be able to get a reasonable amount of work done between charges. The keyboard sits in the middle of the chassis, flanked each side by small and quite tinny speakers. The keyboard is a standard size and, while we found it a little slow to respond, it isn't awkward to use. A single mouse button sits below the rather small touchpad, which means you click one end for standard functions and the other end for right-click actions. The 15.4-inch TFT panel doesn't have a glossy coating, but it proved a brighter panel than many. The widescreen display has a native resolution of 1280 x 800 pixels (WXGA), which is very much in keeping with this price group. It'll come as no surprise to find integrated graphics supporting the screen, with the Intel 915GM chipset producing a low 3DMark 2003 score of 972. Being a Pentium M-based system, Wi-Fi is limited to 802.11b/g, which isn't a problem unless you intend to use this laptop overseas, as UK hotspots use 802.11b/g. Ethernet is the familiar 10/100 Base-T. The optical drive is merely a DVD/CD-RW, so while you can watch DVDs, you're limited to creating CD-Rs. The Pars Xcite 8050QR is a good example of matching price with specification. For the asking price it's a worthy investment with no obvious negative points.